A sprained MCL suffered early in the season put somewhat of a damper on Deng Adel's freshman campaign. After seeing decent minutes in Louisville's opener, and even starting the second game, Adel's knee injury forced him to sit out the next eight games, and severely limited his playing time until late in the ACC slate at the end of February. Taking advantage of a full summer at Louisville to work on his body and skill-level, Adel responded with a strong showing at the adidas Nations camp in Los Angeles in August, ranking as the most productive collegiate player at the event. With Louisville's top three scorers off to the pro ranks, Adel will be asked to shoulder a much more important role as a sophomore, which should tell us quite a bit more about the type of long term prospect he is. As a freshman, Adel averaged just 4 points and 2.1 rebounds in 12 minutes per game, although his minutes did increase to 22 per game over the last five contests of the season, which were somewhat meaningless for Louisville due to their self-imposed postseason ban. Those 111 minutes in five competitive ACC games down the stretch allowed him to get him some much needed experience heading into his sophomore season, and helped scouts get a decent feel for what his strengths and weaknesses are as a prospect. Standing 6'7, 200 pounds, Adel has a solid physical profile for a small forward, with good size and a frame that should fill out nicely in time. His wingspan is just average, measured 6'9 ½ at the Nike Skills Academy in 2014, and he doesn't compensate for that with freakish quickness or explosiveness, but he's a solid overall athlete for his position. Adel shows signs of budding versatility offensively, contributing in a variety of areas for Louisville in his minutes on the floor. He can make a spot-up jumper with clean shooting mechanics and reasonable accuracy, converting 7/20 attempts (35%) as a freshman in limited minutes. He does not possess a very quick release, nor is he much of a threat to make jumpers off the dribble, but he has the framework to continue to improve in this area as his career progresses, which will be very important for his chances. Adel plays with good energy and seems to be a positive teammate, contributing to his team's ball-movement and being willing to push the ball ahead in transition or make a heady entry pass. He turned the ball over at a very high rate as a freshman (29% TO%), though, as he's still working on his advanced ball-handling skills and half-court decision making, which is to be expected considering his late start in basketball (as a 14-year old) and rocky freshman season due to injury. At the moment, Adel isn't someone who is going to create a ton of high percentage looks for himself or teammates in the half-court, as he's mostly a straight-line dribbler who doesn't show much shake or ability to operate at different speeds. With that said, Adel did show some flashes attacking closeouts, using shot-fakes to get his man in the air and attack the rim with purpose, or even some positive possessions out of the pick and roll. It will be interesting to see how he builds on this part of his game as a sophomore, as he'll likely be asked to shoulder more responsibility offensively. Considering the role he'll likely be asked to play in the NBA, scouts will want to see Adel show progress defensively as well, as he was far from a lockdown defender in his limited opportunities as a freshman. Things moved a little too fast at times for him it appeared, as he got lost off the ball a little too frequently, and didn't make any real impact in the passing lanes (0.9 steals per-40) or as a shot-blocker (0.2 per-40), an indication that his feel for the game is still a work in progress. He has some lower body mobility issues that prevent him from sitting down in a low stance and sliding his feet along the perimeter, making him somewhat prone to getting burned off the bounce by smaller and quicker perimeter players. Coming up with some strong defensive possessions at times against bigger players, Adel looked far more effective guarding forwards than wing-types as a freshman, which could hint at his future role as someone who slides between the 3 and 4 spots. Players in this mold who can effectively guard either forward position, while being capable of spacing the floor, attacking a closeout, and making the extra pass, are increasingly popular in today's NBA, so Adel does have a ready-made role if he's able to make strides in some of the areas he already showed impressive flashes in. At the moment, it's not quite clear what Adel hangs his hat on a prospect, as he's not elite in any one facet of the game, but that will be much easier to gauge with a full season to evaluate him. A highly engaging young man, with an incredible backstory, having fled war-torn Sudan for Australia, by way of Uganda, Adel will have no shortage of fans in many different countries cheering him on every step of the way. He's in a great situation to showcase himself at Louisville this season, who are ready to return to post-season action. 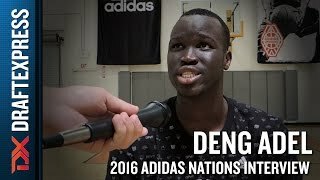 Deng Adel went through an up and down freshmen year at the University of Louisville under Rick Pitino, but he finished on a strong note and looked like he carried that momentum over into the Adidas Nations. His first season of college basketball was plagued by inconsistency and a minor knee (sprained MCL) injury, but towards the end of the year he earned some starts and put together one of his best performances of the year on the biggest stage, going head to head with Duke and Brandon Ingram in a Cardinals victory. In Los Angeles, Adel looked like a player who was building on that success, as he played with a sense of confidence, finishing third in points per game at 11.8 and tied for fourth in rebounds (5.8). At 6'7 with a 6'9.5 wingspan Adel has a very solid frame that should continue to fill out with time. At this point in his career he is stuck between the small and power forward positions, something he will probably be able to get away with at the college level, but might become more of a problem as he gets to the pro game. He doesn't really excel in any one aspect, but finds various ways to contribute on both ends of the floor. He is not the quickest or most explosive guy, but he has a strong first step, and showed he can get to the rim on aggressive straight line takes. Adel plays with good energy, which is evidenced by the impact he has on the game both on the boards and in transition. Last season with Louisville he proved he was a capable outside shooter in a small sample size, hitting 7 of his 20 attempts. He didn't showcase that aspect of his game in L.A. (0-3 3P) but did make some fluid mid-range moves out of the post and hit 72% of his free throw attempts. NBA scouts will also want to see him improve his passing ability, something he hasn't shown at this stage, but he was able to cut down on his turnovers after posting a sky-high 25% TO% last season. Given his length and mobility he has real potential to have an impact on the defensive end of the floor. He can cover ground from the paint to perimeter with ease, and can be a factor as a rim protector. Adel has the physical tools to be an impactful college player, something that will earn him some NBA looks. He still has a great deal of room for growth, as he learns how to play the game under control, and at a high level consistently. His sophomore season at Louisville will be worth monitoring closely, to see if he develops his perimeter skill-set, polish and feel for the game.